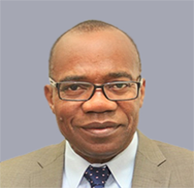 Dr. Nnanna is the Deputy Governor, Financial System Stability, Central Bank of Nigeria (CBN). He also currently oversees the CBN’s Economic Policy Directorate, which comprises the Financial Markets Department, amongst others. He represents the CBN on the Board of FMDQ. He is the Chair of the Africa Finance Corporation and a life member of the Nigerian Economic Society. He has served on the Boards of many organisations, including the Board of the International Monetary Fund. He also served as a Technical Assistant to the National Economic Management Team and the Presidential Steering Committee on Global Economic Crisis.